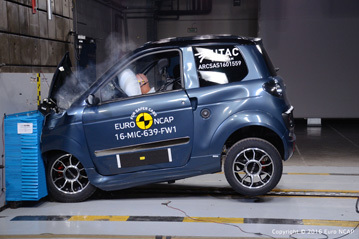 Euro NCAP'in test ettiği Quadricycle ve mikro araba yıldız notlarını yayın tarihi, aldığı yıldız ve markaya göre sıralanmış şekilde bulacaksınız. 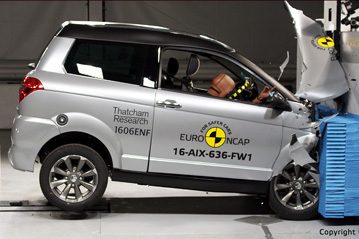 The body structure remained stable in the frontal test and the upper anchorage securing the seatbelt held firm, although there were signs that its mounting bolt had started to pull through the aluminium section to which it was secured. 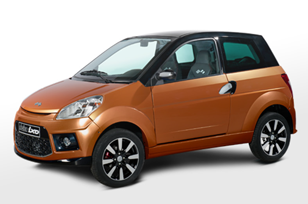 Rearward movement of the engine and transmission pushed the steering wheel of the CH30 rearwards and upwards. 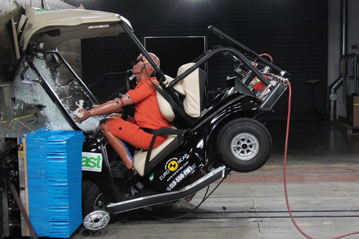 The vehicle has no driver’s airbag and the force with which the dummy’s head struck the lower rim of the steering wheel indicated a high probability of serious or fatal injury. As the steering wheel had moved early in the impact, the chest did not come into contact with it. However, dummy readings of chest compression indicated marginal protection for this part of the body. In the side impact, protection for the head was rated as marginal. 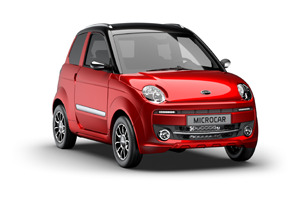 There is no side curtain airbag and the dummy’s head struck the aluminium roof rail, resulting in a high acceleration. Chest lateral compression was also severe and readings indicated that considerable force had been taken by uninstrumented parts of the dummy. After adjusting for this, protection of the chest was rated as poor. Total force on the abdomen was also high and protection of this part of the body was rated as weak. 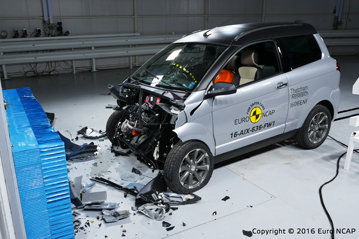 In the frontal impact, the structure of the vehicle stood up well to the impact forces and the passenger compartment remained stable. 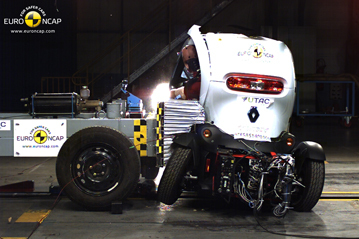 When the side impact vehicle was inspected after the crash, it was seen that a bolt in the rear suspension had hit the fuel tank, leaving a distinct indentation. 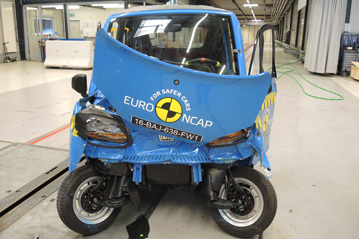 In a slightly more severe accident, or a slightly different configuration, the bolt could puncture the fuel tank and Euro NCAP has advised Aixam to redesign this part of the vehicle. 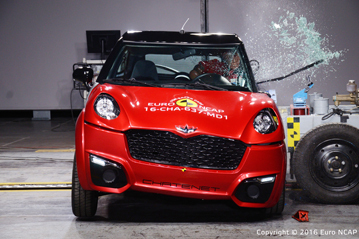 In the frontal impact, the dummy’s head made contact with the centre of the steering wheel as it moved backwards and upwards. 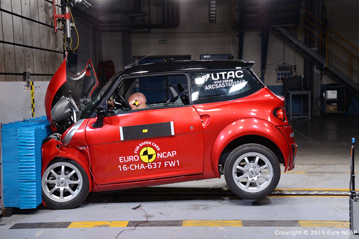 There is no frontal airbag to protect the driver and dummy readings indicated a high probability of serious or fatal injury in a human as a result of this contact. Neck tensile forces were also very high and protection of both the head and the neck was rated as poor. The chest did not strike the steering wheel but high seatbelt loads resulted in values of chest compression indicating a high probability of serious or fatal injury. 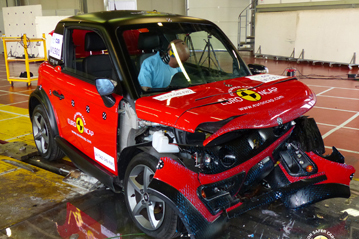 Only in the knee/femur/pelvis body area did the Aixam score points in the frontal test: dummy readings were good but protection was rated as marginal owing to the presence of hazardous structures in the dash area. 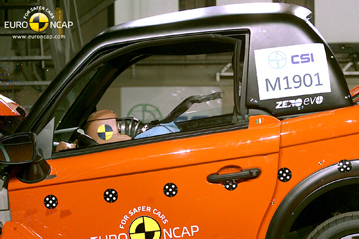 In the side impact, dummy readings indicated good head protection. Lateral compression of the chest was not excessive. However, other readings indicated that much of the force had been transferred in ways that could not be done with a human body i.e. using loadpaths unique to the dummy used in this test. As a result, the score was penalised and protection rated as marginal. Protection of the abdomen and of the pelvis was also rated as marginal, based on the forces measured in these areas. 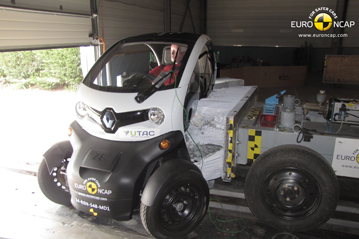 The structure of the Qute was judged to be unstable in the frontal test: many spot welds had released and deformation of the structure indicated that it could not have withstood a higher degree of loading. There were no signs of deformation to any mounting points for the seat belt or buckle. 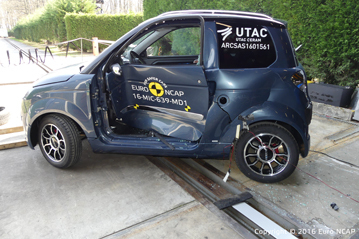 In the side impact, the door on the struck side became detached from the A-pillar as a result of the door structure detaching from the hinges. 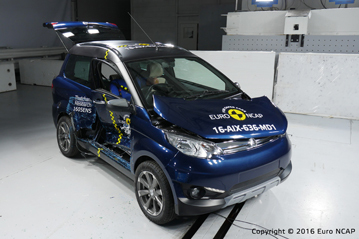 In the frontal impact, despite modest rearward and upward movement of the steering wheel, the dummy’s head made contact with the centre of the steering wheel. 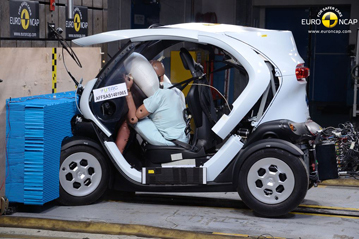 There is no frontal airbag to protect the driver and dummy readings indicated a high probability of serious or fatal injury in a human as a result of this contact. Protection of the neck was rated as good. 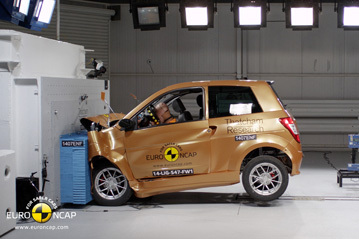 Together with the unstable structure, contact with the rim of the steering wheel gave high chest compressions and the protection offered to this body area was rated as poor. Protection of the knee, femur and pelvis was also rated as poor owing to the presence of hard structures below the dashboard. In the side impact, the force with which the head struck the side roof rail indicated a high probability of serious or fatal injury. There is no side curtain airbag or padding in this area. Similarly, dummy readings of lateral rib compression were high and protection of chest was rated as poor. Protection of the abdomen was rated as marginal and that of the pelvis was good, with only moderate force measured by the dummy. 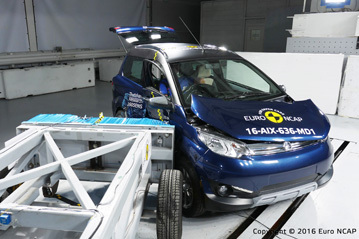 Inspection of the vehicle after the frontal test revealed failures which indicated that the structure could not cope with a higher test speed or mass. 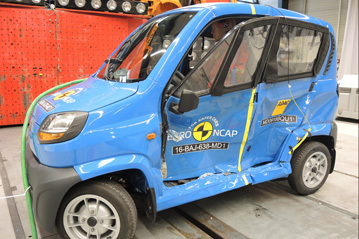 In addition, the seatbelt anchorage at the bottom of the B-pillar broke during the test, severely compromising the restraint system’s ability to provide any protection. This failure resulted in the score for all critical body areas being penalised. In the side impact, the bottom of the B pillar became detached from the sill and three of the driver’s seat mounting points also failed. 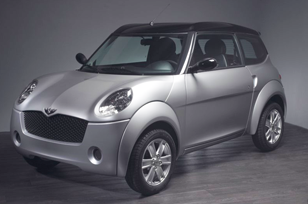 The M.GO Family was equipped with an optional steering wheel airbag. 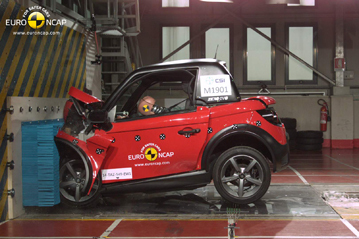 However, in the frontal impact, there was insufficient pressure in the airbag to prevent the head ‘bottoming out’ the airbag and contacting the steering wheel through the airbag fabric, resulting in a penalty to the score. 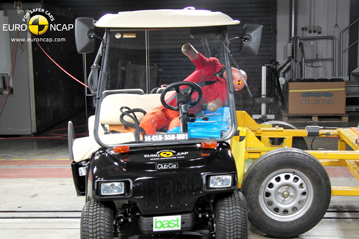 These penalties, together with marginal dummy readings, resulted in a poor rating of the head protection and an adequate rating for the neck. 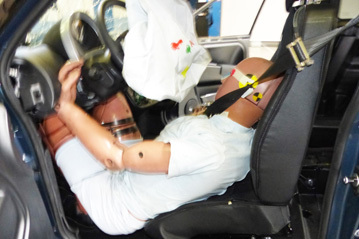 The dummy’s chest struck the steering wheel and this, together with the unstable body structure, meant that chest protection was rated as poor. After the test, the dummy was found to have slipped under the lap portion of the belt as a result of the failed anchorage. Dummy readings in the knee/femur/pelvis area showed marginal protection, downgraded to weak as a result of the seatbelt anchorage failure. The dummy’s head hit the unpadded side roof rail and a high acceleration was recorded, and protection was rated as marginal. Lateral compression of the chest indicated marginal protection. However, other readings indicated that much of the force had been transferred in ways that could not be done with a human body i.e. using loadpaths unique to the dummy used in this test. As a result, the score was penalised and protection rated as poor. Protection of the abdomen and of the pelvis was also rated as marginal, based on the forces measured in these areas. 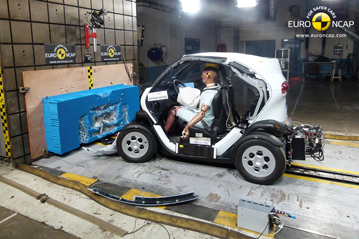 The structure of the Twizy stood up well to the tests with little deformation in the front or side impacts. 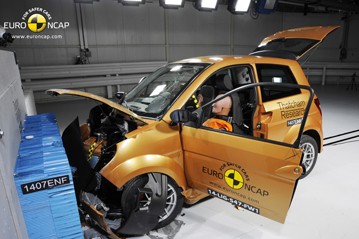 Rearward movement of the steering wheel was well controlled and it was apparent that the structure could cope with a more severe impact. 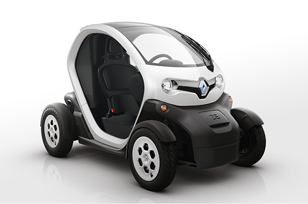 The Twizy has an airbag and a four point seatbelt as standard. 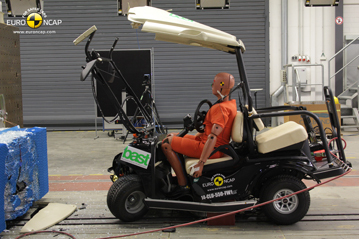 These worked correctly; the driver was well restrained in the frontal impact and protection of the head was good. However, owing to the very stiff structure and restraint systems, the dummy neck recorded dangerously high forces and protection of this part of the body was poor. The region in front of the driver’s knees contained a lot of hard structures. The dummy recorded high values for knee and femur loading and protection was poor. 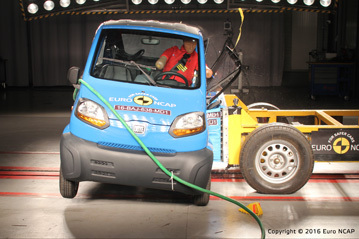 In the side impact, the head of the dummy was exposed outside the structure of the vehicle, increasing the risk of dangerous head contact in real-world accidents, and the score was penalised. Much of the force on the dummy was deflected to parts of the dummy which do not reflect a real body and protection of the chest area was penalised. Combined with dummy readings which were marginal, protection of the chest was rated as poor. 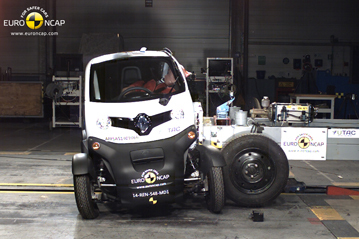 In general, the structure of the Tazzari stood up well to the tests. 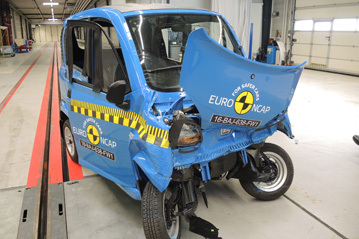 However, when the vehicle was inspected, it was clear that the structure had reached its limit in the frontal test and would not be capable of withstanding a more severe impact. The battery pack is in two parts: front and rear. 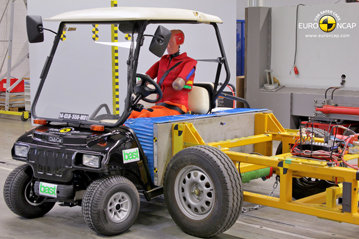 The front battery pack was pushed backwards into the footwell in the frontal test. 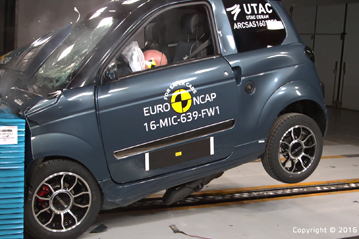 Although the risk of injury to the lower legs was not assessed in these tests, such collapse of the footwell could be extremely hazardous in an accident. 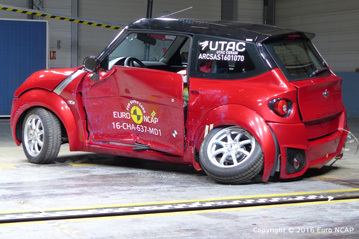 In the side impact, the driver’s door opened, increasing the risk that the driver might be ejected. 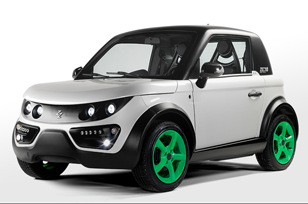 No airbags are available on the Tazzari ZERO. The vehicle has a three point seatbelt but, in the frontal impact, this broke at the point where it is attached to the door pillar. The driver was effectively unrestrained and the dummy’s head hit the centre of the steering wheel with sufficient force for a high risk of fatal injury. Owing to the failure of the belt and the increased risk of injury to the whole body, the scoring for all parts of the body was downgraded. 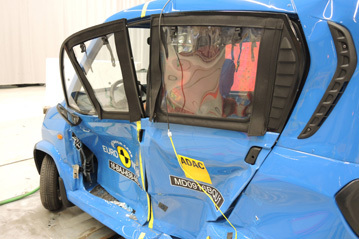 The driver’s seat and its connection to the vehicle floor were intact after the tests. 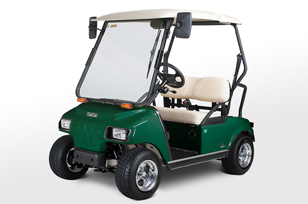 The maximum speed of the Club Car is 40km/h so a frontal impact at 50km/h represents a collision with another vehicle. 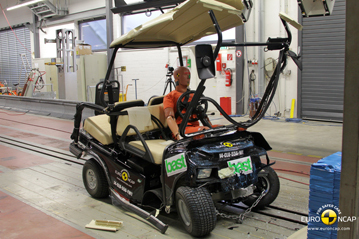 In the frontal impact, the structure of the Club Car collapsed. 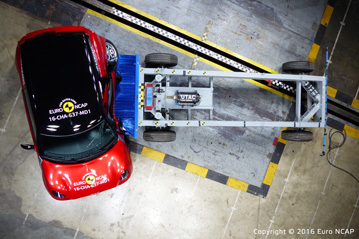 The steering wheel moved rearwards by nearly half a metre. 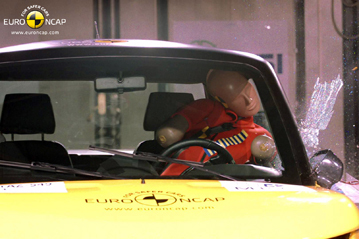 The dummy’s head hit the steering wheel and the values recorded indicated a very high risk of fatal injury. The chest pressed against the steering wheel, taking most of the force of the dummy. 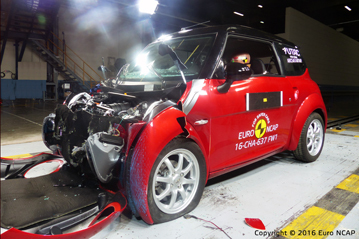 As a result, there was relatively little force on the seatbelts and they, and their connection to the rear pillar, stayed intact during the impact. The seat base hinged forwards in the impact and this, combined with the intruding instrument panel, led to the tops of the dummy’s tibias striking the facia, leading to very high displacements in the knees. Protection of the knees and femurs was rated as poor. 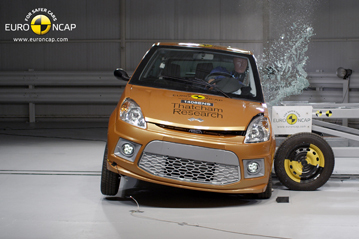 In the side impact, there was nothing to protect the dummy from the striking barrier. 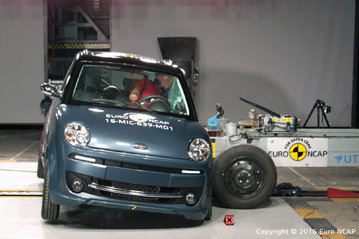 The driver’s seat became detached from the structure and moved sideways, together with the lower part of the test dummy. 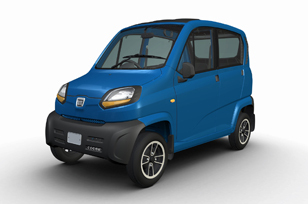 No airbags are available on the Villager 2+2 LSV. The seatbelts did not break or detach in the frontal test as most of the force was taken by the intruding steering wheel. 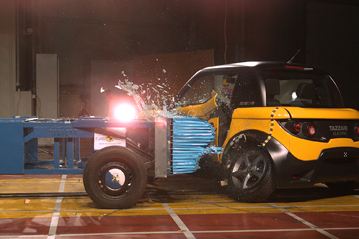 In the side impact, the head of the dummy was exposed outside the structure of the vehicle, increasing the risk of dangerous head contact in real-world accidents, and the score was penalised. Much of the force on the dummy was deflected to parts of the dummy which do not reflect a real body and protection of the chest area was penalised. Combined with dummy readings which were marginal, protection of the chest was rated as poor. The structure of the Ligier was badly deformed in the frontal test. The door pillar and the windscreen pillar were almost separated from one another. The fibreglass footwell area was badly fractured after the test and it was clear that the structure had reached its limit and would not be capable of withstanding a more severe impact. Dummy readings of chest compression indicated a high risk of serious or fatal injury and protection of this body area was rated as poor. 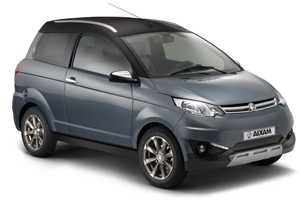 In the side impact, the driver’s door became detached from the car and the bootlid opened. No airbags are available on the Ligier IXO JS Line 4 Places. 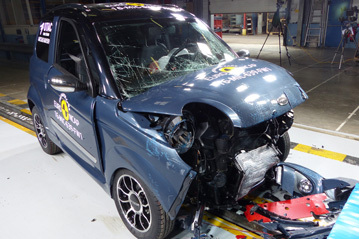 The vehicle has three point seatbelts but, in the frontal impact, the upper connection of this belt to the door pillar pulled out of the structure. The dummy was effectively unrestrained from that point on and the scoring of all body regions was penalised owing to the increased risk of injury. 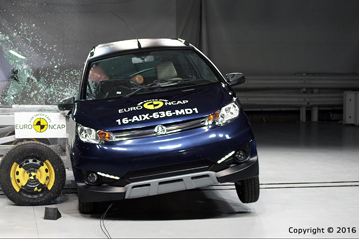 The head contacted the steering wheel, which moved rearwards excessively in the test, and there was a high risk of fatal injury. 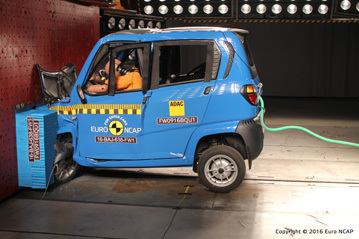 The lap portion of the seatbelt is routed in such a way that it sits very high on the abdomen and, in addition, the driver’s seat collapsed during the frontal test. As a result, the dummy was seen to ‘slip’ under the lap portion of the seatbelt, a dangerous phenomenon known as ‘submarining’ which can be extremely hazardous to the abdominal region. 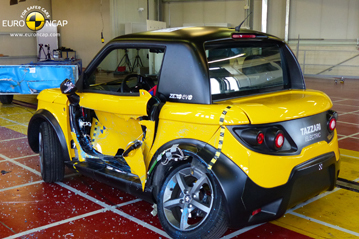 In the side impact, the bottom of the B-pillar broke and the driver’s seat was pushed sideways and became detached from the floor structure.